I know everyone has been talking about Gilmore Girls: A Year in the Life online lately. What they are saying, I’m not sure, as I’ve been intentionally avoiding any feedback on the recently-released four-part miniseries because I haven’t finished it yet. I’ve only watched the first two episodes so far. But I’ll be watching the other two tonight! I became obsessed with the show my junior year of college, when two friends of mine who were Gilmore Girls‘ junkies lent me their DVDs so I could catch up. Between the two of them, they had all six seasons that were released at that time, so I was able to watch the seventh and final season as it aired on TV. Every Tuesday after a long day of class, I would scoot over to one friend’s house near campus to watch it with her and her roommate, who was equally as obsessed as we were. We would sit there enthralled for the hour, then go to one of our favorite bars, The Cabin, for drinks and pizza and post-episode discussion. This was where my friend introduced me to the magical pizza combination of tomato, onion, and feta, for which I’ll be forever grateful! 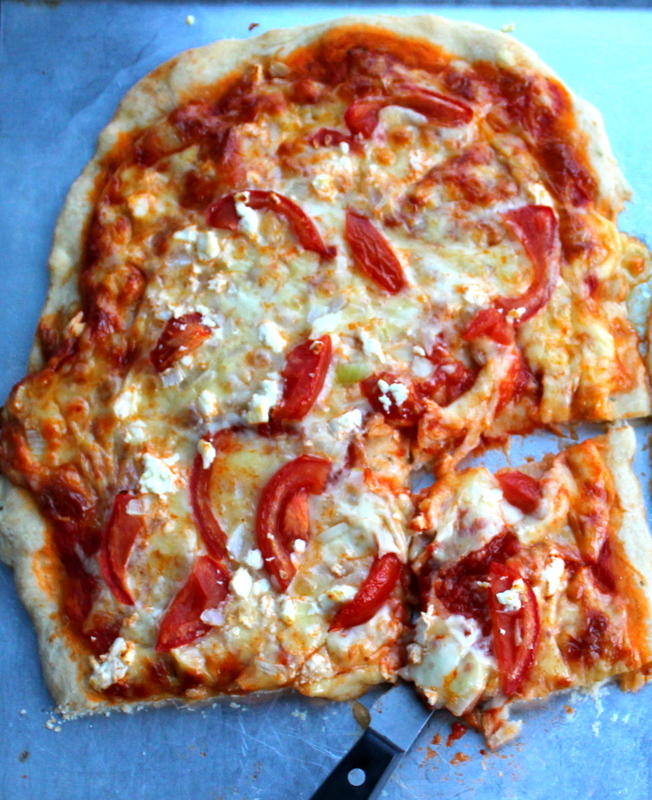 Tomato, Onion, and Feta Pizza – oh, how I adore thee! Seriously, this pizza is BOMB. The acidity from the tomato, the savoriness of the onion, and the tangy bite of the feta go so well together. Savoring this delightful pizza makes the fact that I pretty much abhorred these first two new episodes of GG go down a little easier. Yep, I’ll admit, Gilmore Girls: A Year in the Life carries no magic for me thus far – nor does it for the other Gilmore-loving friends I’m watching it with. Where are the Rory and Lorelei that we adored? ~SIGH.~ I know nine years have passed since Season 7 aired, and all of the actors are nine years older, and they’ve been distanced for nine years from the series, they’ve done other work, moved on with their lives . . . but I really expected them to recapture the magic. If anyone could recapture the magic, I thought it would be Lauren Graham and Alexis Bledel. I expected them to be capable of full-blown working their mother-daughter wizardry to this day – but I would’ve settled for even half of the magic they once had. This is just . . . not that. That’s the most tactful way I can voice my opinion. What do you think of the new Gilmore Girls episodes? Are you loving on them hard, or are Kirk’s slapstick antics the only, only thing redeeming them for you (because he’s the only thing redeeming them for me so far. That man is as kooky as ever!). Post your reactions to the show in the Comments field below. 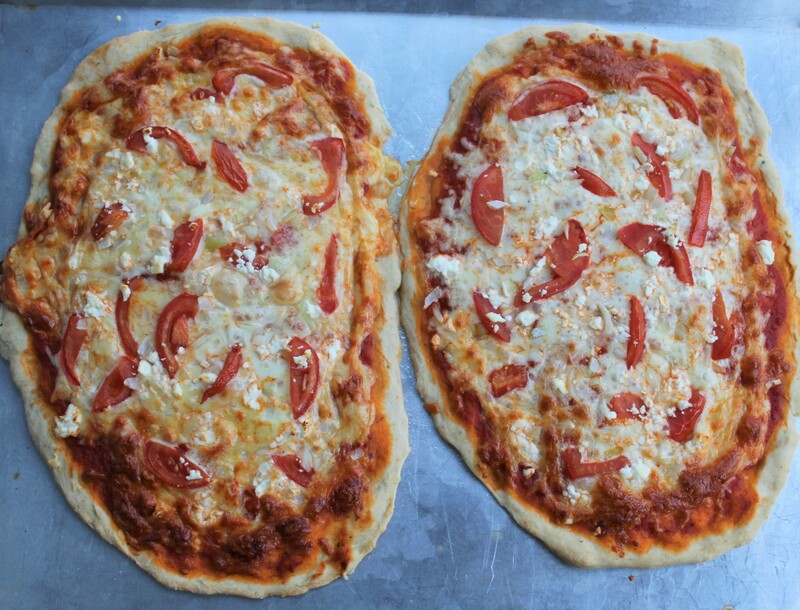 And enjoy the Tomato, Onion, and Feta Pizza – there’s nothing like a homemade pizza with from-scratch pizza dough and fresh ingredients! Preheat oven to 400 degrees. 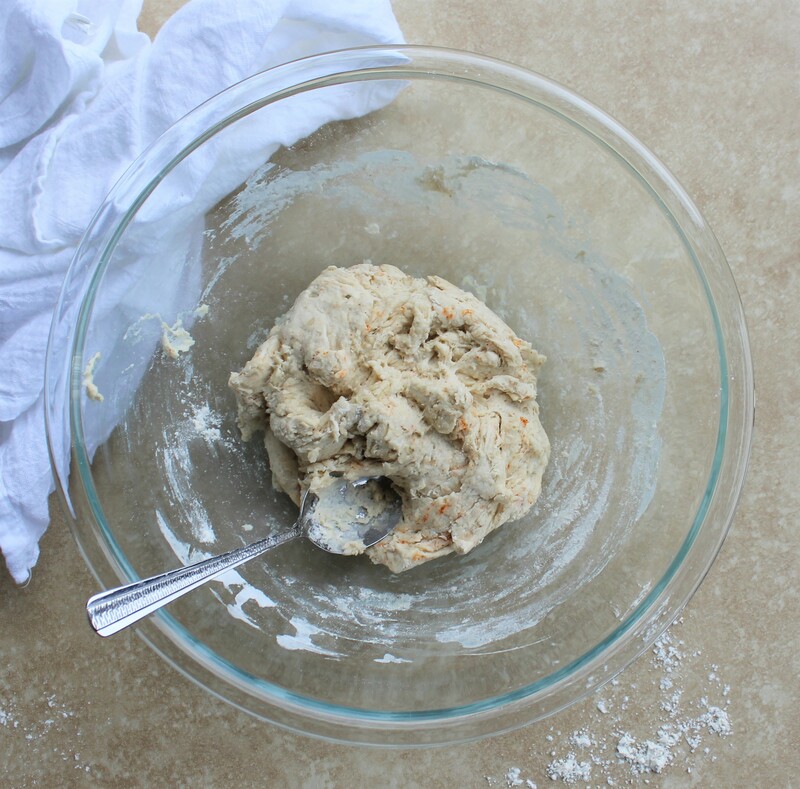 Combine the pizza crust ingredients in a large bowl; once dough has formed, transfer it to a flour-dusted surface, dust hands with flour, and knead it a bit to ensure it’s well mixed. 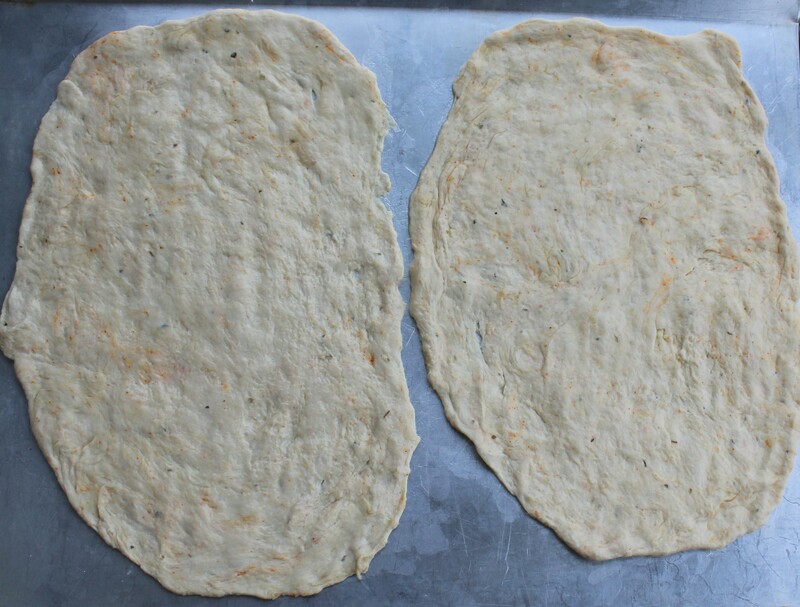 Separate dough into two equally-sized portions if you’d like to make two separate pizzas. Rub a little bit of oil onto your fingers and flatten and stretch the dough until the crust is formed to your desired consistency. 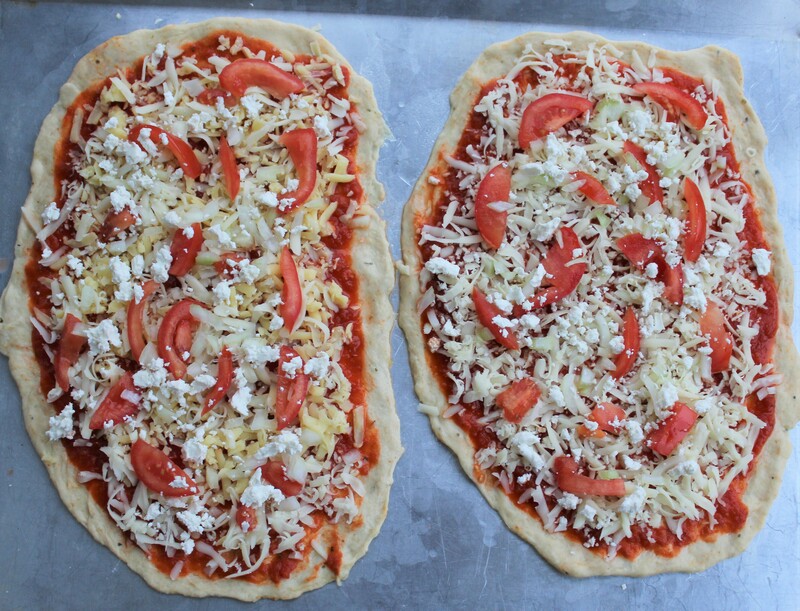 Evenly spread the pizza or marinara sauce over the dough, then sprinkle on the mozzarella, tomato, onion, and feta. Bake until your desired done-ness, about 20-25 minutes. And that’s it! Each thin-crusted pizza yields about eight to ten slices.